Chateau Ravignan 1981 36yo (42.0%): Continuing old Armagnacs after yesterday's post covering a 33yo Domaine de Baraillon... 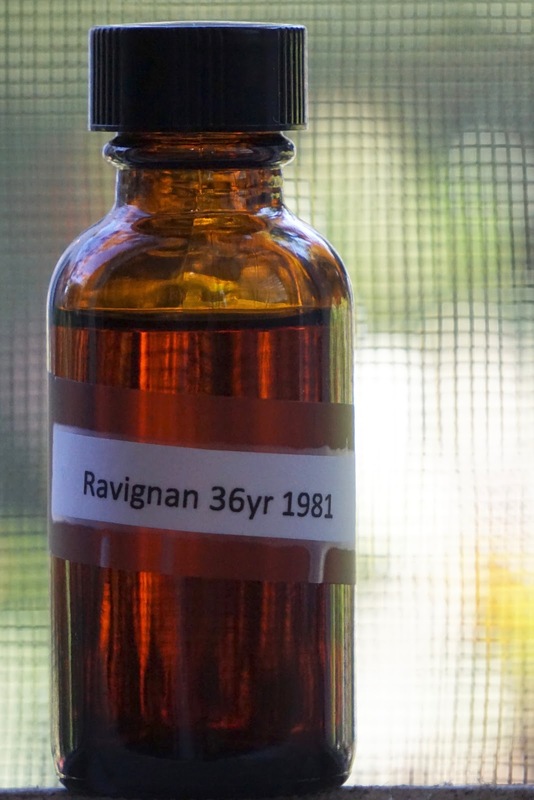 This time I have a 36 year old Chateau Ravignan in the sample bottle. It is distilled in 1981 from Ugni Blanc, Bacco and Folle Blanche grapes and aged in barrels made from trees grown on the property and sourced from the Limousin forest. Color: Buckwheat honey... Impressive dark amber color with a red hue. Very thick slow moving legs. Nose: Oaky and sweet... Overripe baby bananas, sugar molasses and caramel. Aged rum, stewed peaches, marron glacé (candied chestnuts) and tung oil. Freshly applied lacquer and old vintage furniture. Palate: Way more savory and bitter than I expected. Tobacco leaves, dried orange peel and over-brewed black tea. Tannic, oaky and very dry. Burnt citrus, ground cloves and cinnamon. Red wine vinegar and tart molasses. Finish: Bitter and dry. Wet tobacco, dry oak and old leather. Overall: If I didn't enjoy the nose that much my score would be even lower... I have to say that I didn't enjoy the palate and the finish that much. It is borderline bitter, sour, oaky and spicy... I am afraid that this one might have passed its prime time in the barrel. Thanks again to Derek Kendzor for the sample, this would be an expensive mistake to make considering its price tag.